Charles Kurzman, “Teaching Middle East Crises,” October 31, 2014. Those of us who teach international subjects may wonder whether and how to address the latest Middle East crises in our courses. These events are unavoidable in the news, and many of our students have strong feelings about them. How can we navigate the emotional and political difficulties associated with these crises and tie current events to broader themes that run throughout our courses? I met this week with a group of high school and middle school teachers to discuss these questions. Their courses on world history, social studies, and other subjects cover huge swaths of the human experience, so they can’t devote too much time to any single event. Plus, they don’t necessarily bring an in-depth familiarity with the Middle East, and they are wary of the hyperbole and bias that lurk in much of the information that is available on the region. I’d like to propose three ways to link current crises in the Middle East with major issues in international studies at the K-12 and college level, along with some resources for research-oriented assignments on these subjects. 1. Sensitive subjects are okay to talk about, so long as we do so respectfully. I would rather teach a difficult subject than let the students stew in their own misconceptions. 2. All discussion of the subject must be based on evidence. No speculation, no hearsay, just presentation and evaluation of systematic evidence. Every issue we teach is ultimately a lesson about research: what counts as evidence, how to collect it, and how to analyze it. 3. Disagreement is okay, so long as it is evidence-based. We don’t have to end up being unanimous. 4. No sentence can begin with the words, “Islam says…” For the purposes of social-science research, it is more important to investigate what believers consider their religion to mean — and how believers differ — than to offer your own version of what it means. 5. Look for historical change. Most of the “ancient” aspects of the Middle East are modern inventions, and tracing the emergence of these phenomena is a key to understanding them. This is one the most symbolically potent issues on the planet: two fiercely nationalistic populations struggling over a small slice of land, with billions of people around the world following along intensely and taking sides. There is no “neutral” position on this issue — any attempt at being even-handed may be considered wholly unfair by one side or another, since partisans on this issue do not feel that opponents are morally equivalent to themselves. So as a teacher, you can’t win. But as a teacher, avoiding the issue doesn’t constitute winning either. Israel and Palestine may be the world’s only case of “duplicate nationalisms” — two mutually exclusive nationalist visions that, at least in the hands of hard-liners, map onto one another perfectly. 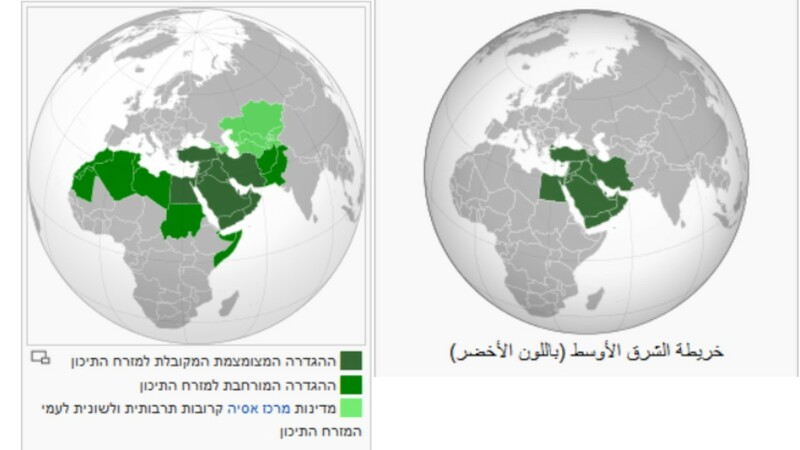 We see these maps on the webpage of the Israeli settler group Yesha and on the logo of the Palestinian revolutionary group Hamas — the same land, from the Jordan River to the Mediterranean, claimed for two nations. When did these nationalisms arise? As it turns out, these are not ancient territorial identities. Political Zionism, which envisioned a Jewish state of Israel, was founded in the 1890s by Theodor Herzl of Austria-Hungary; Palestinian nationalism was founded in the late 1910s, two decades later. These were part of a wave of nationalist movements stretching around the globe, which helped to form the national identities that we take for granted today. There are scholarly debates about the origin of this wave — some studies argue that nationalism emerged in the 18th century or earlier in places like France, which has had a “national” state for centuries. In any case, nationalisms spread like wildfire — or maybe a better metaphor would be telegraph wires or steamship traffic — in the late 19th and early 20th centuries. Not all of these nationalisms succeeded in establishing national states (there is no country called Turkestan, for example), and not all of today’s states were an outgrowth of nationalist movements (many were created by colonial powers). But once a state was established, it worked hard to deepen nationalist sentiments in its population, using holidays, rituals, school texts, military institutions, and other mechanisms to make the nation seem natural and inevitable. That’s how we ended up with a world of nations, where we expect every space and every person to be part of a nation, but it was not always thus. As an exercise, take a map of the Middle East (or any other region), pick a national border, and try to determine when it was drawn, and by whom. The self-styled Islamic State rejects the national borders of the Middle East as illegitimate, and seems to reject the idea of nationalism entirely, claiming instead to represent a global Muslim constituency. Few of the world’s Muslims accept such a claim. The Islamic State’s extremist interpretation of Islam and its public displays of violence have undermined its appeal. Some Muslims insult the Islamic State by calling it Da’ash, the Arabic acronym for the revolutionary regime’s former name, the Islamic State in Iraq and al-Sham (the Levant). The acronym sounds like the word for “trampler” in Arabic. The revolutionary upheaval in Iraq and Syria is the latest in a seemingly endless series of conflicts in the Middle East. Is the region especially prone to war? To answer this question, let’s turn to the comprehensive list of armed conflicts since 1946 made available online by the Uppsala Conflict Data Program in Sweden. This list includes all conflicts with 25 or more battle-related deaths in a single year. One notable finding from this list is that the number of conflicts worldwide is lower over the past decade than it has been since the early 1970s. You wouldn’t guess it from news headlines, but the world is relatively peaceful these days. Of the 33 conflicts identified in 2013 (the list is updated each summer to include the previous calendar year’s conflicts), four took place in the Middle East, down from a peak of 8 out of 52 in 1991. This rate is higher than the Middle East’s share of world population (around 7 percent), but hardly an epidemic. As an exercise, download the Excel version of the armed conflict dataset and see which country has engaged in the most conflicts since 1946. The “Arab Spring” of 2011 has been almost entirely suppressed, at least for the time being. Only Tunisia, which launched the wave of uprisings, continues on the path of democratization — the country just held its second free parliamentary elections this week. Egypt, by contrast, has come full circle back to a repressive military regime, after last year’s coup d’état. Libya and Yemen, which ousted longtime dictators in 2011, are now largely in the hands of militias. Syria’s uprising has descended into civil war. It may be tempting to conclude from these dismal outcomes that Arab societies are somehow unfit for democracy. Do Arabs really want democracy? No doubt some don’t. In every new democracy, there are segments of society that consider their compatriots to be incapable of wise political decisions. There are segments of society that lose an election and worry that they will frozen out of power forever. For them, learning to live with majority rule will take time and practice. The Tamarrud (Rebel) movement in Egypt, for example, was so upset with the country’s newly elected government — which was, truth be told, more than a bit of a mess — that it rallied hundreds of thousands, possibly millions, of demonstrators to call for a military solution. But Egypt is not unique — several months earlier, a similar movement rallied hundreds of thousands of people against an elected government in Thailand, far from the Middle East. There, too, the movement ushered in a coup d’état. More commonly, though, new democracies falter not through widespread opposition but through the actions of a small elite — military leaders or tycoons or aristocrats who feel that democracy threatens their privileges. They make coups or set up private armies or undermine elected governments to counter democracy’s widespread appeal. That is the situation in much of the Middle East today, and in many other undemocratic countries as well: authoritarian governments ruling pro-democracy populations. As an exercise, look at public opinion reported in the World Values Survey. This massive project, one of the largest social-scientific enterprises in history, has surveyed nationally representative samples in more than 90 countries, asking hundreds of questions about politics, culture, and myriad other subjects. Through the World Values Survey’s online analysis tool, look at the percentage in each country that support democracy. Then pick some cultural subject and look at opinions in each country on that subject. You may notice that there is far more variation on cultural themes than on democracy. Much of the world’s population, in the Middle East and elsewhere, is culturally conservative and politically liberal — they favor religiously-inspired laws, but want them to be implemented by democratically-elected leaders. That is the norm in the Middle East, and not so foreign to many students in the United States.